Access to the interior through the large access hatch allowed some interior work to be done. One early step was to install the tubing for the air supply for the “exhausts”. When the exhausts were made, I epoxy cemented short lengths of brass tubing into the opening of each, then let that tubing through the hull. 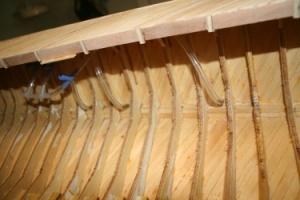 Plastic air tubing for aquarium use was then used, with connectors and control valves, to make a manifold on each side for later connection to an air pump. I am planning to use a 12 volt air pump such as those used to aerate bait tanks on fishing boats as an air source. 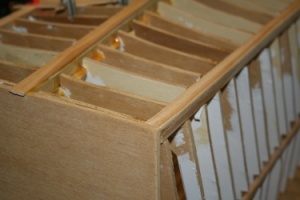 The access hatch was sanded and fitted to the opening and supports installed along the side. The cabin itself fitted atop the first layer of deck planking. In this shot you can see the paper cans used to make up the gun turrets, to be added later. The hull planks were milled from white pine. They were cut to a thickness of about 1/32″ and width of about 3/16 inch. 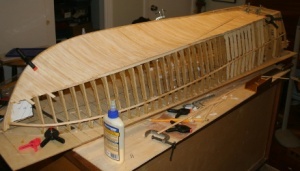 The planking was in a double layer, as in the original boats, with the first layer glued onto the frames in a diagonal orientation, about 45 degrees from the frames in the mid portion of the hull, and as it ran for the remainder, especially in the bow. 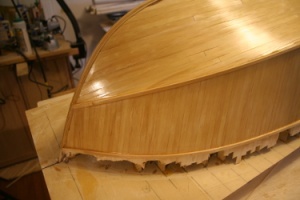 The first layer was slanted directed toward the bow above the chine, and opposite below the chine, to make a chevron pattern pointing aft. Then a layer of thin cotton fabric embedded in waterproof glue was laid over the first layer of planking, taking care to smooth it well and eliminate air bubbles. Once that layer was dry, the final layer of planking was installed, with the planks above the chine at a diagonal opposite the first layer, and the planks below the chine running nearly horizontal fore and aft. 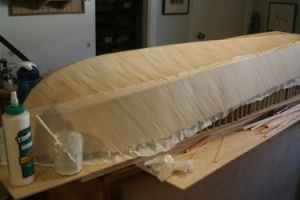 The hull with the first layer of planking installed and the fabric layer applied over the planking. 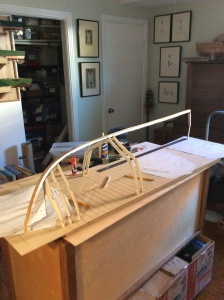 I used Titebond III waterproof glue to install the planking and to embed the fabric layer. Second layer of planking done, chine/spray rails installed, and first coats of urethane marine varnish done. Note the direction of the planking as described above. 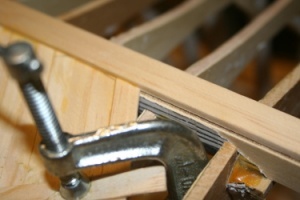 The hull cut free of the building board and the board converted to a cradle. The exhausts are carved from maple and painted gold/bronze. The exhausts are hollowed out and have plastic tubing for an air pump to create, I hope, somewhat realistic exhaust bubbling later on. 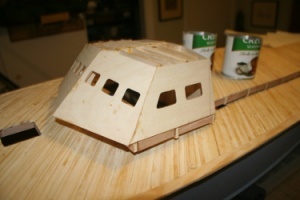 This blog will follow the construction of an electric powered, RC controlled, scratch built model of a Higgins 78 foot PT boat. I have built several other similar boats in smaller scale, the largest a 1:20 model of a 77 foot ELCO. But having returned to New Orleans, living near City Park and Bayou St. John, where the Higgins PTs were built and initially launched, I wanted to build a boat to operate on the Bayou. The Bayou is a tidal estuary and the waters can be rough in windy weather. In addition, there are commonly floating hazards, from bottles and bags to driftwood and turtles. And the occasional gator. So I wanted a boat large enough and strong enough to operate safely. The smaller, 1:32 scale boats, would be fine on calm days in the inner part of the Bayou, but probably not able to function in rougher waters. I also wanted performance to at least appear to match the prototype with a boat that would plane and show a small rooster tail at speed. And a finished boat that would appear, at least from a modest distance to be realistically armed and have animated functions that would make it fun. These latter desired characteristics led to my exploration of computer chip controlled LED lighting and sound. The posts will be in reverse chronologic order and updated monthly.